Journal Jottings : LIFE: 5th to 18th February. LIFE: 5th to 18th February. The past two week have been characterized by a “A Chorus of Coughs” as N. and I succumbed to another cold bug, just as were getting over the flu. So it has been back to hot drinks, hot water bottles and paracetamol - with a good day followed by a zero energy day. Oh, for some sun and warmth, instead of temperatures currently n the range 1-4C/32-38F. I gave a miss to the Walking Group and the Women's Institute Meeting where the talk the "History of the Rugby Sevens - not something I was vastly interested in. 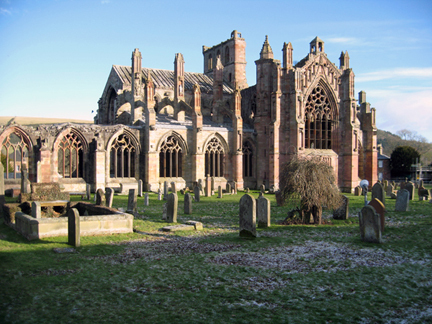 A visit to Melrose for the usual - post office, library and coffee shop. That was a morning when the wintry sun was shining on the abbey highlighting the detail of its architecture. A morning in Galashiels was less successful in that we got caught in the swirling wind of sleet and snow, and by the time we were walking the short 5 minutes back home from the bus stop the wind chill factor had set in. School half term, though they hardly seemed to be back since New Year, so we had Nh a couple of days. We had an enjoyable baking session, making chocolate brownies and chocolate chip cookies - and managed to leave some for Nh to take home for tea. 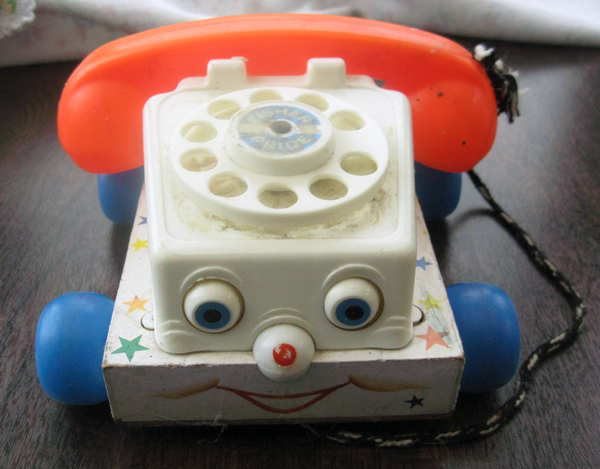 We sorted out Nh toy boxes here and did manage to reduce the collection, but she is a bit of a hoarder, so some favourites had to stay - such as Fuzzy Felt and anything that had been Mummy's such as the Fisher Price telephone. Who remembers that from the 1970's? "Michael Portillo's Great American Railroad Journey" ended its Eastern coast programme in Canada, including a visit to Montreal and McGill University. I was hoping that it would feature John Redpath, a stone mason and builder who emigrated from Earlston in 1820 and became a prominent businessman and benefactor in the city. He was involved with major canal schemes, built Canada's first sugar factory, and the Redpath Library and Museum at McGill University are named after him. He did not forget his birthplace and donated the clock and belfry tower in the Market Square. John Redpath is precisely the kind of profile that the programme does so well, but it was not to be. - a pity. 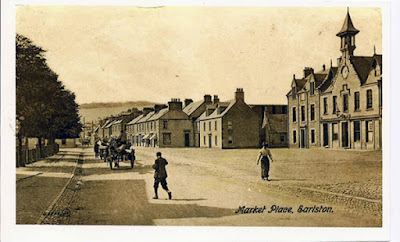 It would have been good to see a Scottish Borders connetion on screen. Earlston Market Square c.1900 - John Redpath's clock & belfry tower remains the significant landmark in the village today. The programme has now moved cross country to California and brought back memories of my visit there 1966 and more recent mailings and postcards etc. from a great American friend G.
"A Vicar's Life" series is profiling the work of English vicars across rural Herefordshire, who seemed more and more to be acting as social workers - helping the homeless. acting as street pastors in town centres at the weekends, visiting isolated elderly people etc. Despite the obvious pastoral commitment and hard work of the ministers, I cannot help thinking, that the traditional church service is onto onto a losing battle, with increasingly elderly congregations. It must be hard to keep up motivations through it all. We have been following chef Tom Kerridge's series "Lose Weight - East Wel" and there are some good ideas there. So I set out to make the Roast Vegetable Tart for tea. I had just put it in the oven when the phone went. It was a friend who lives on her own and is undergoing chemo treatment, so I did not want to say, "Can I phone you back?" - the result I forgot about the tart until I could smell something overdone. N. nobly said we would still eat it, but it was not great, so I will have to try it again, with more of an eagle eye on the oven.